Even though most Americans know fast food isn't a healthy choice, fast food consumption continues to escalate in the United States. 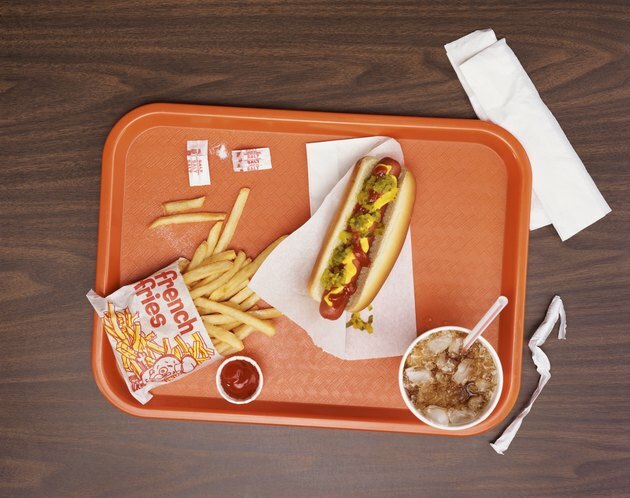 Dr. Mark Pereira, assistant professor of epidemiology at the University of Minnesota, states that despite fast food restaurants offering healthier options, their menus still contain a lot of fat, sugar and calories with little nutrients and fiber. Over time, eating too much fast food leads to weight gain and chronic medical conditions. In addition to choosing healthier options at the drive-thru window, determine how often you eat fast food and consider cutting back to stay healthy. A study published in "Obesity Surgery" in May 2012 examined the behaviors of 270 obese patients and compared them to the patients' body mass index. The results indicated that fast food consumption had the largest impact on obesity levels. A study published in January 2004 in "The Lancet" showed that over a 15-year period, young adults who ate fast food more than twice a week gained an additional 10 pounds compared to those eating it less than once a week. One meal from a fast food restaurant typically contains the amount of calories you need for the entire day. The average fast food meal contains 1,000 calories, including refined carbohydrates, which can raise blood sugar levels too high according to the American Diabetes Association. The 2005 study in "The Lancet" also showed that young adults who ate more fast food had a two-fold increase in insulin resistance, which is associated with Type 2 diabetes. Type 2 diabetes puts you at risk for a host of complications, including skin and eye problems, nerve damage, kidney disease, stroke and high blood pressure. The average American gets 3,400 milligrams of sodium a day -- well above the 2,300 milligram recommendation. Daniel Pendick, executive editor of "Harvard Men's Health Watch," states fast that foods give you too much salt and that their sodium content is on the rise, which doesn't bode well for your heart. Consuming too much salt raises your blood pressure levels and forces your kidneys to work harder putting you at risk for heart problems, kidney disease and stroke. High salt intake is attributed to 2.3 million deaths worldwide, but by reducing your fast food intake you can avoid becoming a statistic. According to the Centers for Disease Control and Prevention, one in 10 Americans suffers from depression, and diet might be a big part of the problem. A study published in March 2012 in "Public Health Nutrition" followed nearly 9,000 people who had never been diagnosed with depression. The results showed that people who ate fast food had higher rates of depression compared to those who did not. The more fast food participants ate, the more likely they were to be depressed.